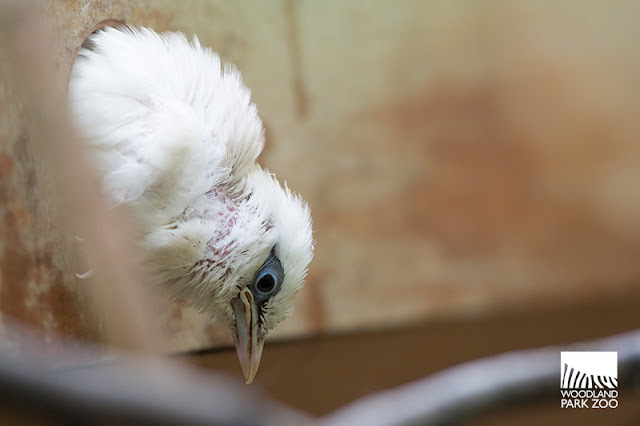 On September 17, three tiny white birds hatched in a quiet behind-the-scenes area of Woodland Park Zoo as part of the zoo’s conservation breeding program. 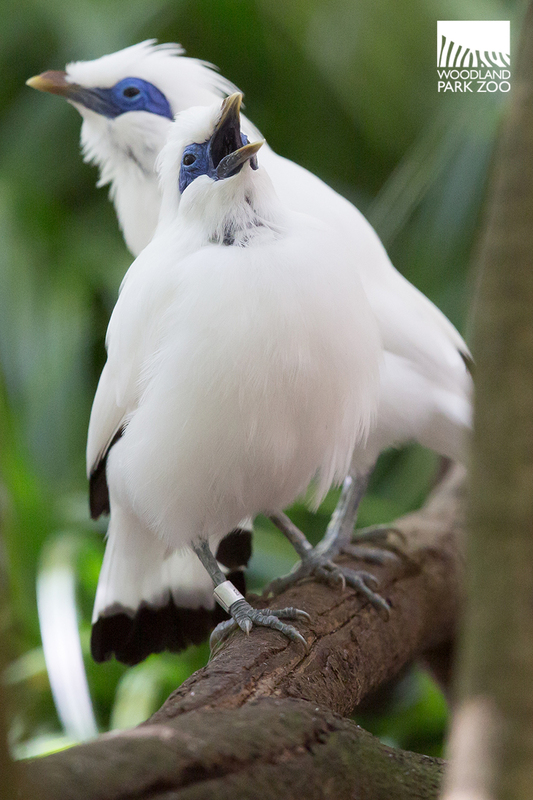 The chicks, downy fluff balls with snow-colored plumage, are a big deal: they represent the first successful hatches of the critically endangered Bali mynah here at the zoo in 22 years! They also act as a powerful symbol of hope for their species. This shy chick gave our photographer a run for his money. 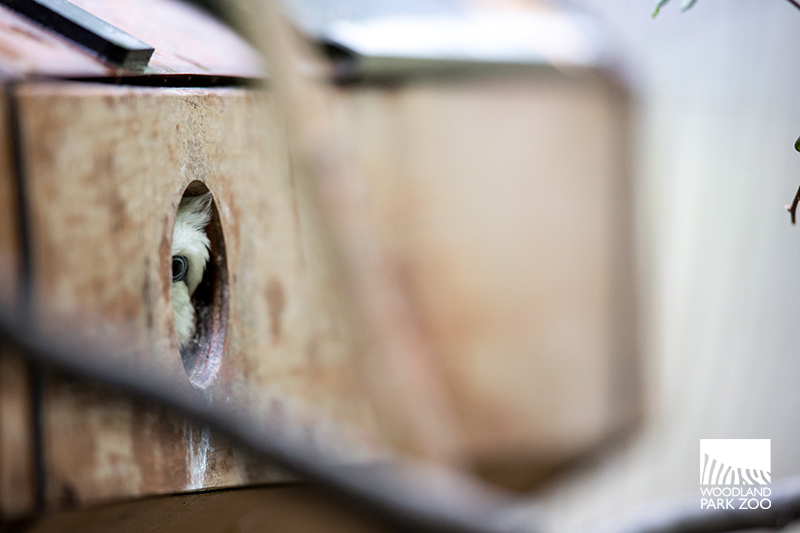 The nest box is the perfect hiding spot. A curious look outside of the nest gives us a better view of a chick. Endemic to Bali, Indonesia (an island smaller than Rhode Island), Bali mynahs are threatened primarily due to illegal pet collection and trade. Their stunning white feathers and gorgeous cobalt blue patch around the eyes make this beauty especially attractive to bird collectors, despite their endangered status. On top of poaching, their habitat —open lowland forests—is also increasingly compromised due to habitat alteration. One of the parents keeps an eye on the photographer. In the wild, their numbers have been reduced drastically since the species discovery in 1912, with reported numbers down to just 6 individuals in poor years. 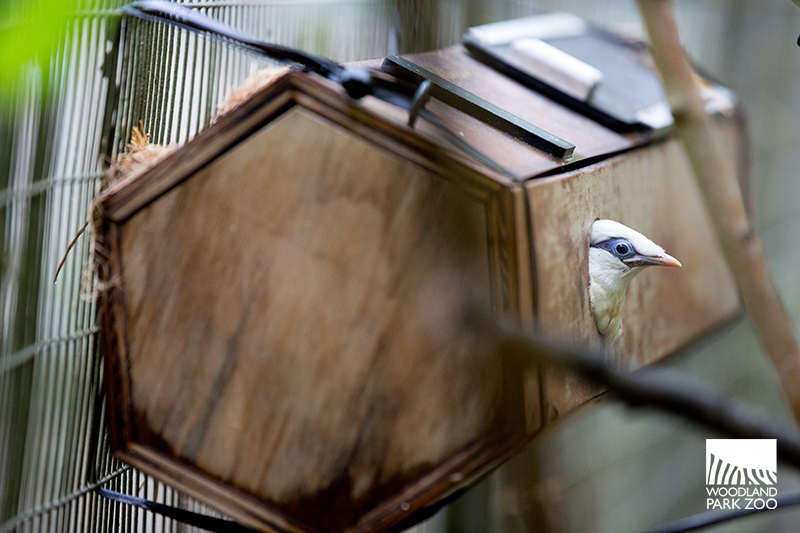 The Bali Starling Project has helped support populations in Bali Barat National Park and Nusa Penida, a small island where a second population has been created through releasing captive-reared birds. However, the wild population is still thought to number fewer than 50 mature individuals. 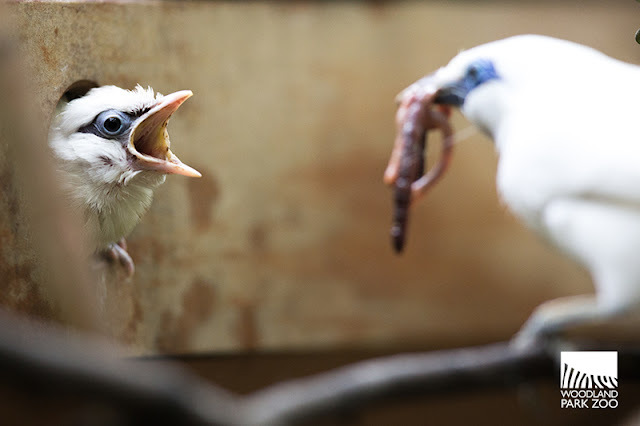 While the wild Bali mynah population has shown some encouraging signs, it is the job of zoos to keep the genetic population varied in the captive population. In the past decade +, the Bali Mynah Species Survival Plan (SSP) has been focused on maintaining a genetically and demographically healthy population in US Zoos. VIDEO: Watch the chick peek out from its nest box. Woodland Park Zoo participates in the Association of Zoos and Aquariums Bali Mynah SSP. This year is the first successful hatch at Woodland Park Zoo since 1993, and we are delighted. Behind the scenes at the zoo. Waiting for a snack, this little chick is eager grab whatever is being delivered by a devoted parent. At birth, the chicks weigh only a few grams, but they grow quickly and eventually reach an adult weight of 70-115 grams. The chicks are just now beginning to leave the nest, but they still receive a lot of attention and food from their parents. In the wild, Bali mynahs make their nests in the cavities of trees, and feed on a variety of insects, worms, fruits and small reptiles which they lovingly feed to their young. At the zoo, our birds are fed a variety of fruits and vegetables, mealworms and crickets. The devoted parents take turns delivering breakfast, lunch and dinner to the new chicks. Bali mynahs are typically monogamous; together the long-term pairs built nests, raise their young and defend territory. Their beautiful cobalt blue eye patch and striking white plumage really stand out. In Bali, the mynah is a beloved symbol. The birds appear on the 200 rupiah coin and is designated the faunal emblem of Bali. The birds are popular subjects in the art and culture of the region. 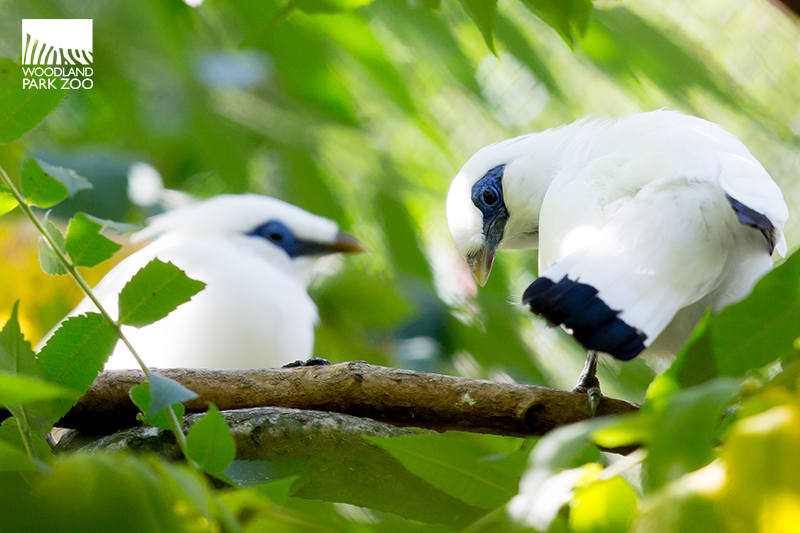 As the Bali mynah’s plight is becoming more understood, local Balinese have helped to slow the possibility of extinction. Villages and community leaders have pledged to stop the illegal capture of the wild birds, but unfortunately poaching is still lucrative in the bird markets. You can visit these beautiful symbols of hope at the Conservation Aviary. For now, the young chicks will remain off view while they continue to grow. Soon, they will learn to make a famously loud variety of noises –chatters, whistles and squawks—just like their parents. When you visit, you might hear them make a lot of strange sounds. 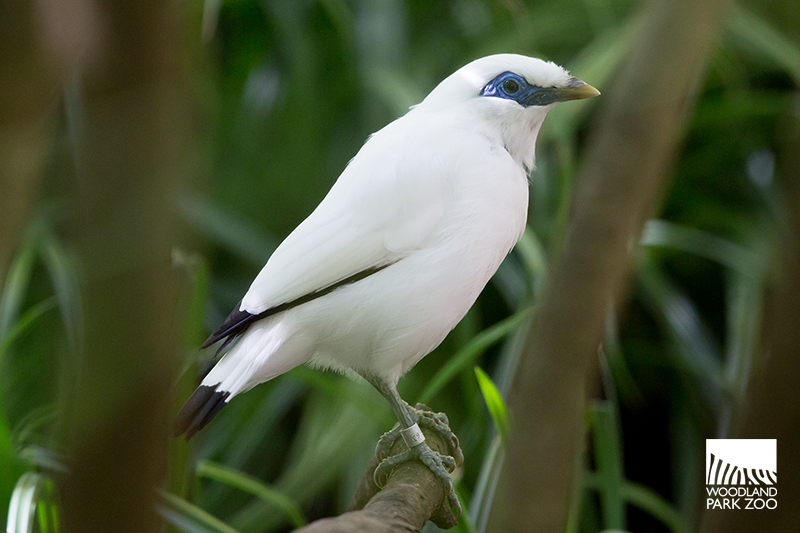 Bali mynah are known to produce a plethora of noises, from cackles to chirps, whistles to squawks. How do you get a tortoise to take its medicine?